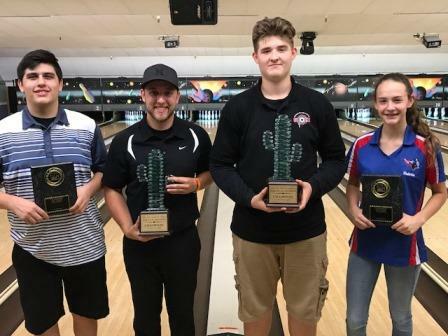 Nick Devlin and James Wilson earned the coveted glass cacti as champs of the JBT Desert Open Marathon, hosted by Glenfair Lanes. Chase Nadeau qualified first after 15 qualifying games on the very challenging wolf, badger, and bear patterns, and elected to bowl the matchplay portion on badger. The bigger problem for him was his thumb, which was completely torn up by the end of qualifying. He bravely got through matches against Trevor Thompson and Russ Oviatt, before bowing out to Sergio Torres in the semifinals. On the other side of the bracket, Devlin got by Kevin Banaag and Kyle Gilbert, before doing what nobody else in the country could do in July- stopping back-to-back Gold champ Solomon Salama in the semifinals, to advance to one last title match in his JBT career. The title match was well bowled by both but turned on a ninth frame open from Torres, allowing Devlin to climb back into the match. Finishing with five of the last seven strikes, Nick forced Sergio to double for the win. Torres' first shot left a 4-pin, and with that Nick got the storybook finish to his JBT career, earning his 23rd title of his career with the comeback victory. Phillip Sauve performed very well in yet another major, grabbing the top seed for matchplay. Abby Franklin was able to upset him in five grueling games in the quarterfinals though, before she in turn was stopped by Wilson in the semifinal match. The other side of the bracket was highlighted by an incredible comeback from Veronica Potter, who found herself down 0-2 in her very first match, then peeled off the next seven wins, blitzing newcomer Josh Williams, Darren Fletcher, and Justin Worthington on the way to the title match. The finale featured two (very understandably) tired bowlers, but in the end Wilson had enough steam left for the victory, the second of his JBT career. Huge thanks to Glenfair for a great job hosting this exciting event. Want in on all this fun? Just check out our upcoming schedule and come on down! All bowlers roll 15 games each on 3 different lane conditions! - 1 PM: round of 16, best 3-of-5 matchplay, highest scratch seed chooses pattern! ENTRY FEE: $100 (includes all scholarships except brackets, available on-site.) $500 first place guaranteed (plus below)! 2nd- $250 - the famous glass cactus trophy! 5th-6th $100 at EVERY 17-18 JBT event!